Home » WordPress » WPForms vs Gravity Forms – Which is the best WordPress forms plugin? 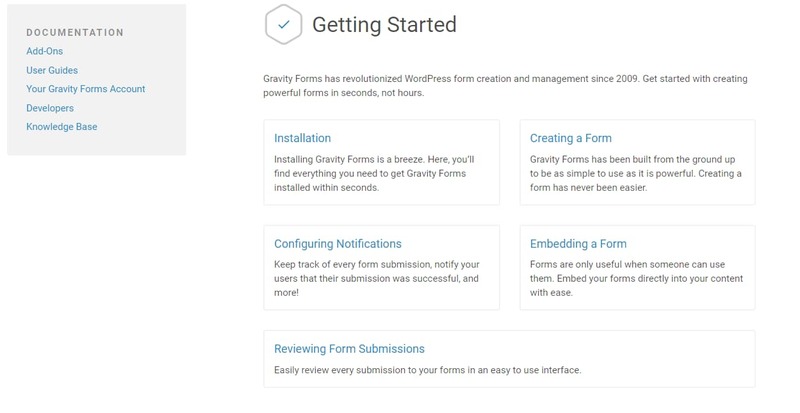 If you had spent some time looking for the best WordPress forms plugin on the internet, you would have definitely come across WPForms and Gravity Forms. Both of them are quite popular among WordPress users, developers, and agencies. While WPForms is available for free and for a cost (premium plans), Gravity Forms is available only for purchase. That is, there is no free or lite version of the Gravity Forms plugin. 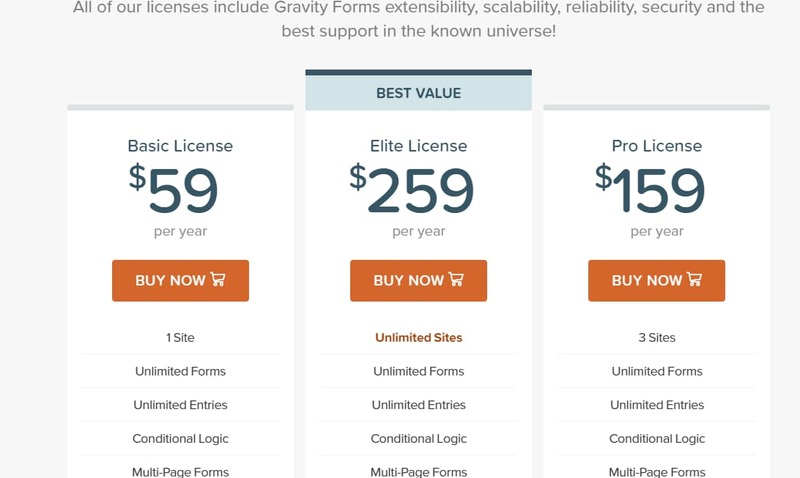 And since Gravity Forms is a premium WordPress plugin, I will be comparing it with the premium version of WPForms plugin so that there’s a level playing field. Both WPForms and Gravity Forms are awesome and comes with advanced features which can help us build sophisticated WordPress forms with ease. But, which one is really the best and worth your money? Let us find out in this WPForms vs Gravity Forms comparison post, where I’ll be sharing the complete overview, core features, and advantages of both the plugins. 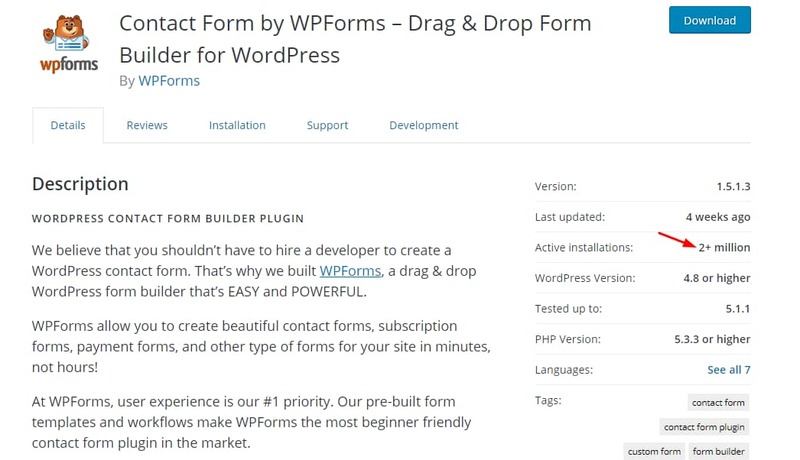 WPForms is simply the best WordPress form builder plugin. It is simple, easy to use, and powerful. 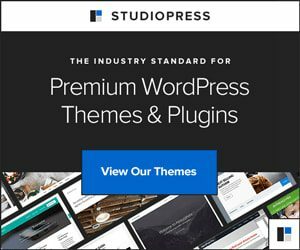 It is designed, developed and marketed by the same team behind other popular WordPress plugins like OptinMonster (WordPress popup plugin), MonsterInsights (WordPress Google Analytics plugin), Envira Gallery (WordPress gallery plugin), Soliloquy (WordPress slider plugin) and SeedProd (WordPress coming soon page and maintenance mode plugin). Since it comes from a stable of very popular WordPress plugins with more than a couple million installations, we can rest be assured about the plugin’s quality, support, and service. Like I had mentioned earlier, there’s a lite version of the WPForms plugin which can be downloaded and used for free by anyone. But if you need more powerful features and advanced customizations, you will have to upgrade to one of their paid plans which are somewhat similar to Gravity Forms plans and pricing. The WPForms Lite plugin is quite popular among WordPress users which are reflected through its 2 million+ active installations on WordPress sites. Moreover, it has got more than 3700 five-star ratings on the WordPress plugin repository page. It’s no easy feat to achieve. What this means is that there are so many people who love the free version of the plugin. Imagine the amount of time and efforts it would have saved them that they took time to review the plugin. The pro version of WPForms is even better and has got some cool features that aren’t present in the free version. I have covered most of their pro features in my WPForms review. You can check it out to learn more about it. Gravity Forms is another veteran WordPress forms plugin that has been in the forms industry for quite some time. 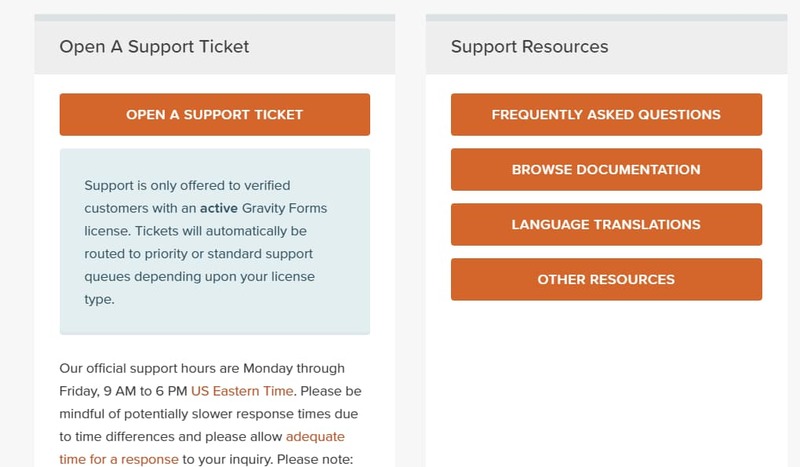 Unlike WPForms, Gravity Forms doesn’t come with a free or lite version and one has to buy the plugin before they can try it out to check if it’s the perfect fit for them. But they have got a 30-days refund policy during which you can request for a refund provided you meet the criteria outlined in their refund policy. On the other hand, WPForms offers a 14-days no questions asked money back guarantee. By the way, there are many different add-one available for Gravity Forms using which you can extend the functionality of Gravity Forms. Many business websites also rely heavily on Gravity Forms for their day to day activities. Both plugins offer great features and it is definitely hard to choose the right one for you. But worry not. By the end of this post, you will be able to pick one winner from both. I will show you the best features of these plugins and help you to choose the right one. 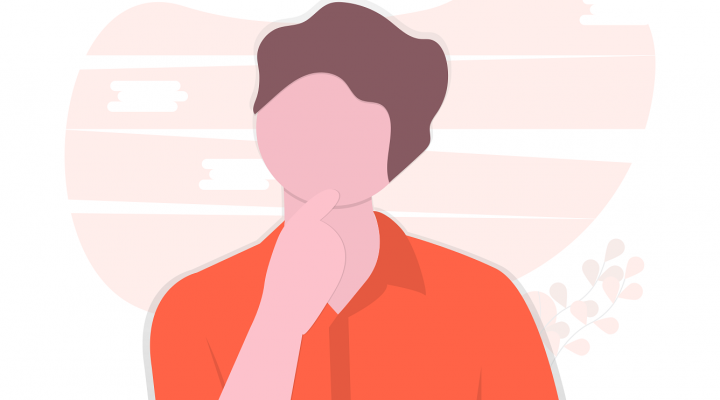 When it comes to comparing two WordPress plugins which provide the same functionality, their installation process and ease of use must be taken into consideration. These contact form plugins should also be beginner friendly. Both WPForms and Gravity Forms offer drag and drop form builder support. Now, let’s see how can we install and activate these plugins in addition to finding which one is easier to use. Step 1 – Go to the ‘Add New’ section under your plugins menu and search for ‘WPForms’. It will be displayed as ‘Contact Form by WPForms – Drag & Drop Form Builder for WordPress’. Once you find the plugin, click on the ‘Install Now’ button. Step 2 – Once the plugin is installed, don’t forget to activate it. Step 3 – You are now ready to create forms on your website. You can also access the plugin settings right from your WordPress admin menu section. In the free version of the WPForms plugin, there are some limitations to the form builder. But if you are using the premium version of the plugin, you can create almost any type of WordPress forms you need. 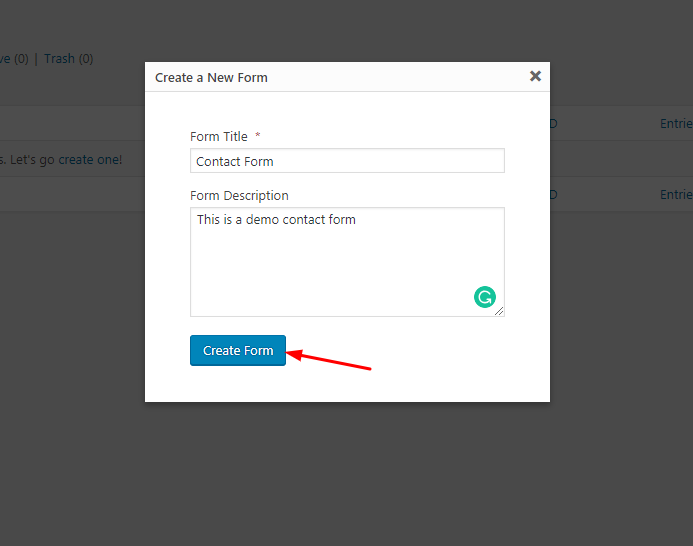 Step 4 – Now, let’s create a simple contact form using WPForms. As you can see from the below image, the form building interface is clean and easy to understand. Step 5 – If you want to add additional fields, you can just drag the elements from the available fields and drop them into the form builder. Don’t forget to save the settings to publish the changes. Step 6 – You can now display the form on a post, page or a custom post type. But for this example, let us display it on a page. Go to an existing page or create a new one to insert your form. On the page editor screen, you will be able to see a new ‘Add Form’ button. Step 7 – Click on the ‘Add Form’ button to choose your form. Once you have selected the form, click on the new ‘Add Form’ button to insert it into your page. You can also choose to display your form name and description but that won’t be needed in most cases. 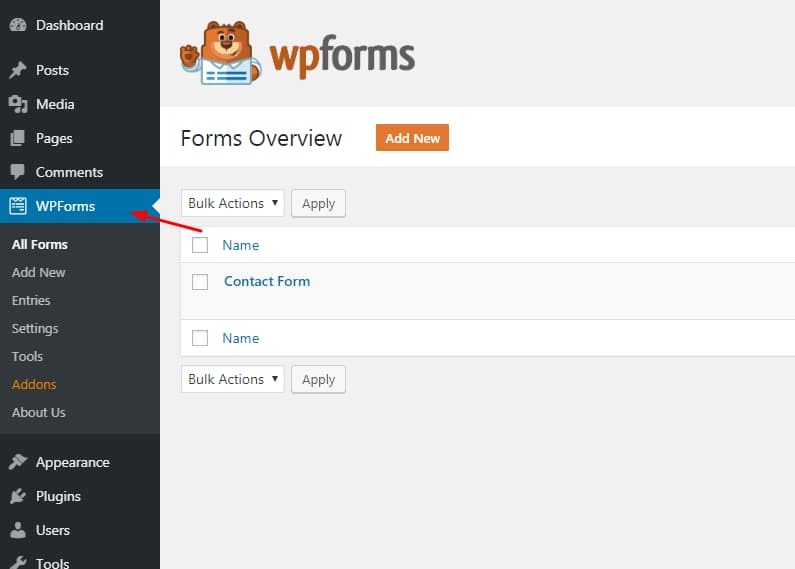 Step 8 – Once you have inserted the form, you can see a WPForms shortcode on your page. Now, it’s time to publish the changes. Click on the ‘Update’ button to save the changes made to your WordPress page. Step 9 – Don’t forget to check if your form is being displayed correctly on the front end. If everything is fine, you have successfully created and inserted the form on your website. Now, let’s see how to install Gravity Forms and create a sample form using it. Since Gravity Forms is not available for free, you cannot install it directly from the WordPress plugin repository. You will have to download it manually and upload it to your WordPress site. Once you have purchased a valid license, you can download the latest plugin files from your Gravity Forms account. Step 1 – Download the Gravity Forms plugin setup files from your account. Don’t download the add-ons at this time. Step 2 – Go to the ‘Add New’ plugins section on your WordPress site and upload it by selecting the files from your computer and clicking on the ‘Install Now’ button. Step 3 – Once you have installed the plugin, activate it. 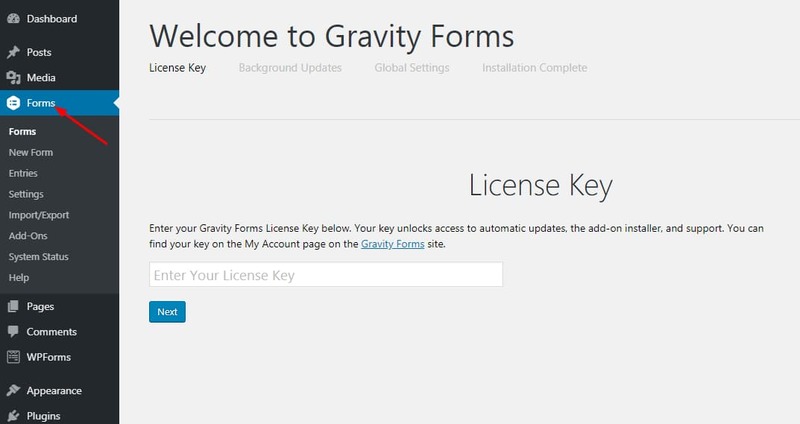 Step 4 – Now, it’s time for you to activate your copy of Gravity Forms with a valid license key. You can still work on Gravity Forms without entering a license key but you will miss out on automatic updates and security patches which is not recommended. Step 5 – Once you activated the plugin with a valid license key, you can start creating forms. Once you click on the ‘Create Form’ button, you will be redirected to the form creating wizard. Step 6 – Building forms using Gravity Forms is a bit complex for beginners. From the right panel, you can drag the elements and drop them into the field to add them to your new form. Step 7 – You can check the live preview of the form in a new tab by clicking on the ‘Preview’ option. 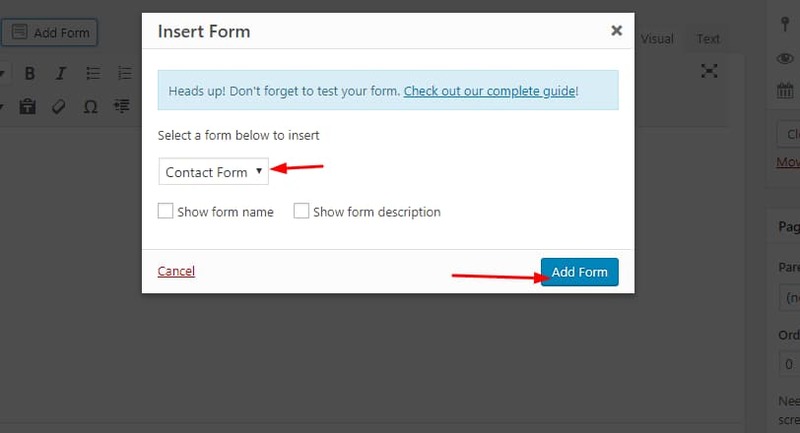 Step 8 – Just like how you added WPForms in the above section, you can also add forms built using Gravity Forms to your WordPress posts and pages the same way. 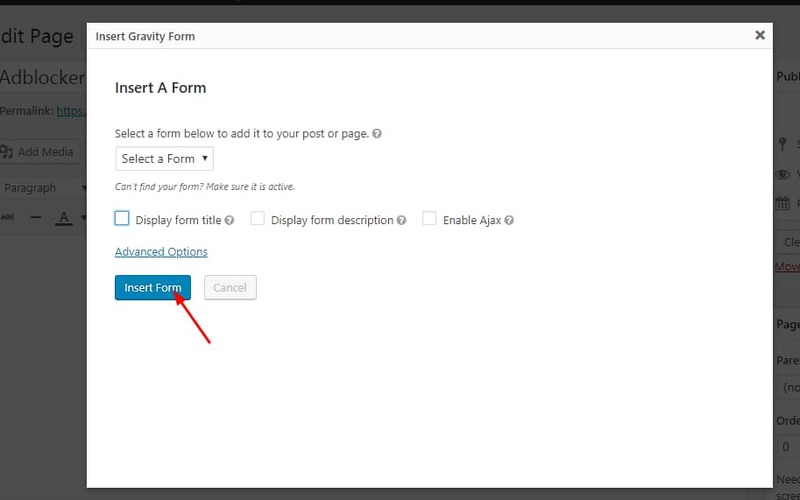 Go to your WordPress editor screen and there will be an option to insert forms. Click on the button, choose your desired form and insert it right away. Step 9 – Update the page once the Gravity Forms shortcode is inserted. That’s it, you can check if the form is working properly by checking it from your front end. Your customers and casual website visitors can now use the form to get in touch with you. NOTE: Configuring Gravity Forms is a bit tricky when compared to WPForms and the process is not always straight forward. Since we had created only simple forms, I couldn’t demonstrate the complexities involved. Both Gravity Forms and WPForms are powerful form builders but for most of the people out there, WPForms is an easier solution. By the way, Gravity Forms doesn’t come with form templates like how WPForms does. You can use form templates to save time and get more creative. Imagine building a form from scratch every time you need to design a new form for your company website. Add-ons are what make the form builders more powerful and feature rich. They help extend the functionality of these form maker plugins. I have listed some of the best features and add-ons offered by WPForms and Gravity Forms in the below lists. You can have a look at it and pick out the one which you deem the best. Apart from the above addons, both the plugins allow us to connect our forms with several other useful apps and services which can help improve our business and productivity. Moreover, it can provide a better user experience on the site. For example, if you are creating an email subscription form to collect your site visitors’ email addresses, you might want to consider connecting the form to your email marketing provider to automatically add them to your email list. This could save you a lot of time filtering real email addresses from bogus addresses and adding them manually to your email list. Well, let’s see some of the major integrations offered by the WPForms and Gravity Forms plugins. NOTE: For both WPForms and Gravity Forms, the add-ons and integrations which you can use are limited by the type of license you have. Not all add-ons and integrations are available on all plans. 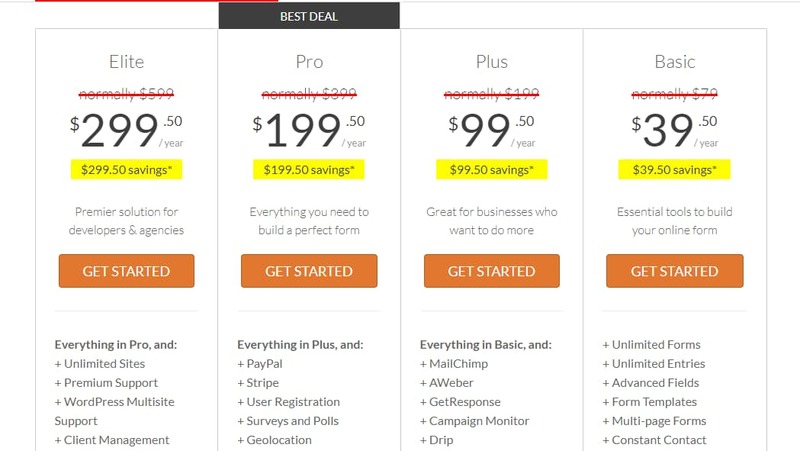 So, be sure to check their pricing page carefully before you purchase any plan. What good are WordPress forms on our website if we are not able to find how well they perform. Contact forms are one of the primary ways your potential customers or clients can leave you a message. If you are a business or a freelancer, form conversions are very important for you because if someone leaves you a message, it means they are interested in buying your product or service. So, there are high chances for them to convert. But how will you be able to find how many people who land on your forms are actually filling the data and hitting the send button? That’s where forms tracking comes into the picture. Now, Let’s see how we can track forms using WPForms and Gravity Forms. 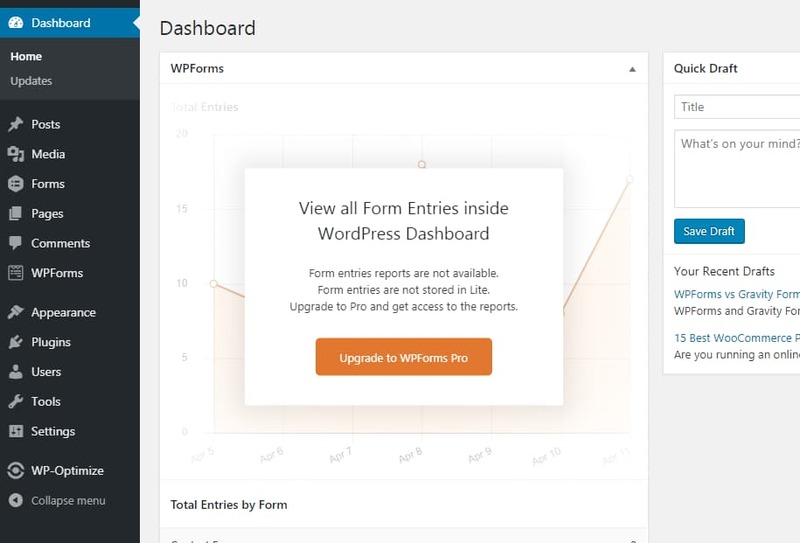 If you have got the pro version of WPForms, you can view all form entries from within the WordPress dashboard. This feature is not available on the free WPForms Lite version which you can find on the WordPress plugin repository. You can get the most out of WPForms by just purchasing their Pro plan and get access to the total number of form entries from, conversion rate, and many more. 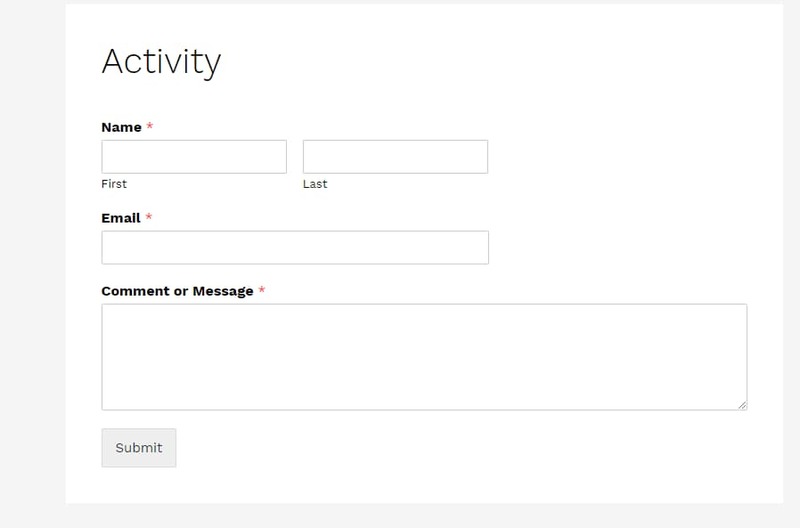 Gravity Forms makes it easier for you to manage your form entries reports. You can see how many times your forms were displayed to your site visitors, how many people filled them and what your overall form conversion rate is by visiting the Forms section on your Gravity Forms menu. You can also see the form entries right from within your WordPress dashboard which is a great feature. NOTE: If you are using the MonsterInsights plugin on your site, you can make use of its ‘Forms Tracking’ addon to properly track your form views, submissions, and conversions rates. The addon works well with both WPForms and Gravity Forms. Customer support is a very important factor to consider when you are buying a product or service. Imagine paying for a WordPress plugin where you just get the plugin files and updates but literally no customer support. That’s really bad for business. It can easily eat away your time and mental peace. But not all customer support are equal – some are good and some are downright bad. Now, let’s see how both these plugins fare when it comes to customer support. The customer support offered by WPForms is very good. 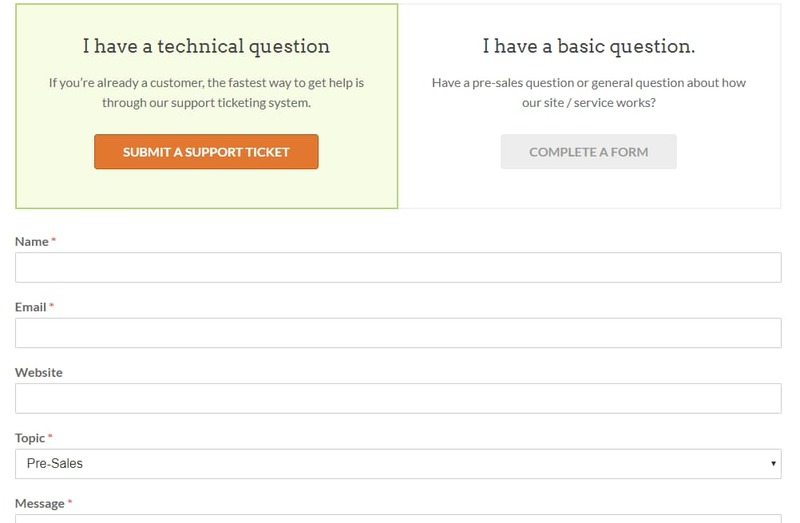 It doesn’t matter whether you are a Lite user or a paid customer, everyone gets support from WPForms but the place where they can get support differs a bit. Free users can get support from their support page on the WordPress plugin repository while premium users can get priority support directly by raising a support ticket from their WPForms account. If you have got any pre-sale questions, bug report or issues with the documentation, you can fill out the form which they added on their contact page. Usually, they will get back to you within 24 business hours no matter which premium plan you are on. Gravity Forms support is pretty good too. All you need to do is, open a support ticket if you face any difficulty and they will have you covered. You will get priority support if you have got the Elite plan. All other license holders will get standard support. For priority support, you will get a response within 24 hours and for standard support, you will get a response within 48 hours. Moreover, they won’t be available to answer your support requests during weekends. 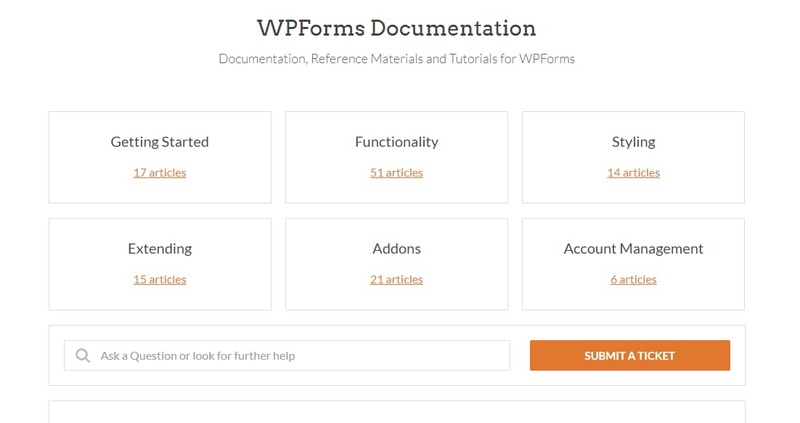 WPForms has got a rich documentation section. If you are not able to find a proper guide for your needs, you can raise a support ticket and let the support team know about your issues. They will get back to you with the solution and update their documentation to add any missing pieces. Gravity Forms has got an equally rich documentation section. They have simple guides for WordPress users which are easy to understand. Most of the people, especially bloggers and developers out there prefer affordable form builder solutions for their own blogs and their project sites. It makes sense if you’re not willing to shell out a whole lot of money just for implementing good looking and functional forms on your website. Not everyone needs powerful features, smart conditional logic, and advanced integrations. But for companies and agencies, this can be really sweet. They can save a lot of time and work smartly while providing their clients with ‘the best’ solution out there. Let’s take a look at the pricing of both plugins and find which one is more affordable. Whether you are just starting out or you are a pro WordPress user, WPForms offers the best value for your money. If you are managing your own website, the Basic plan is good for you. If you need to build powerful forms on multiple sites or need advanced integrations, go with the Pro or Elite plan. As you can see from the above pricing plans, it’s hard to judge which plugin is costlier as it depends on what features you are looking for and for how many sites. If you think WPForms is costlier, it is while at the same time if you think Gravity Forms is expensive, it becomes one. It’s very hard to judge which one is better from their pricing. Both plugins are great when it comes to creating advanced WordPress forms. If you don’t want to deal with complex stuff, I suggest you go with WPForms but if you don’t mind venturing into the complex stuff, pick Gravity Forms. WPForms looks basic but is powerful and you can create any type of form you want with it. Gravity Forms, on the other hand, looks complex but once you get a hang of it, you can create powerful forms. On the whole, I think that the WPForms contact form plugin will play nicer than Gravity Forms. So, I highly recommend the WPForms plugin. Before you upgrade to one of their paid plans, you can test out the WPForms Lite plugin on your blog to see their basic features. I hope you found this WPForms vs Gravity Forms comparison post really helpful and enjoyed the read. If you did, please consider sharing this post with your friends and fellow bloggers on social media. It will also help them to choose the right plugin for their business.